Outstanding service without Premium Price Tag ! Benchmark Cleaning Services are specialists in a wide variety of commercial cleaning services for your business. We recognise that maintaining a clean working environment can be tricky whilst balancing a busy working life. Therefore we have designed a service to take this stress off your hands, whether you’re looking for office cleaners in the London area, shop cleaners or looking for commercial window cleaning – our friendly cleaners have the right training and dedication to help you! Having an unclean working environment affects your working life, therefore we aim to take care of every aspect of cleaning in your building. We employ professional cleaners who are outstanding at their job. They will maintain your Office Cleaning whenever you need them, whether that is for one hour a week or four times a week. Our cleaners are presentable, uniformed and dedicated to your business. We are experienced in a wide range of cleaning practices and aim to provide a fresh service. Not only do we provide Commercial Cleaning for offices but also a Shop Cleaning , School Cleaning, Bar Cleaning, Bespoke Cleaning, Office Window Cleaning, Commercial Carpet Cleaning , Chewing Gum Removal, Hospital Cleaning, University Cleaning, Surgery Cleaning service. Like offices, it’s important that you keep on top of your shop cleaning or it can be challenge to keep up with the maintenance. However, our cleaners will visit your shop, clean and maintain an environment suitable for both you and your customers. No matter how big or small your business is; our commercial cleaning services London are available for you! Building cleaning is offered to those businesses located in Central London and London. To maintain your premises, contact Benchmark Cleaning Services and we will take care of everything for you. Our services can be tailored to your requirements and budget. We are experienced in a wide range of cleaning practices, and aim to provide a flexible service to all our clients. With over 10 years in the cleaning industry we have many satisfied clients across all sectors. Benchmark Cleaning Services offer tailored commercial cleaning for offices and commercial properties throughout London and the South-East. We take care of every aspect of office cleaning, maintaining a good working environment for your staff. Our professional cleaners are carefully selected based on their skills and location. We can provide office cleaning services to any business, however big or small. We aim to build a lasting relationship with all our commercial clients and so strive to exceed your expectations. We guarantee to provide you with regular, reliable, trained, professional office cleaners. We have a large range of clients – including shops, offices, restaurants and bars, schools and many other types of business. We have many satisfied clients, and can offer you references to give you peace of mind. Whatever type of windows, no matter how high, we employ all the latest methods to ensure your glass will be left sparkling clean. For external windows, the preferred method is Reach & Wash, where ionised water is fed through carbon fibre poles to reach heights of up to 80 feet. 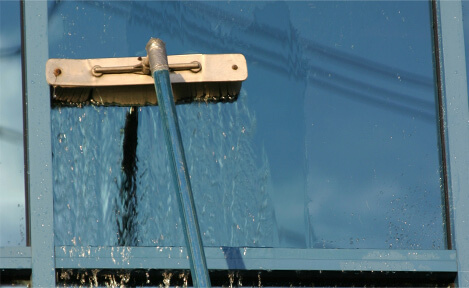 The ionised water traps all dust and particles, leaving your windows as clean as can be. Our specialist commercial window cleaners are trained in all types of access methods, from abseiling to powered cradles, so we are able to tackle everything from bungalows to skyscrapers. Our trained cleaners can provide on-site commercial carpet cleaners and flooring cleaning, using the latest equipment and cleaning materials. 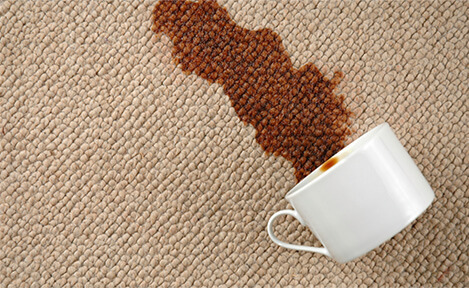 We can clean your old, tired looking carpets, leaving them looking fresh and new, saving you the time and money of replacing them. 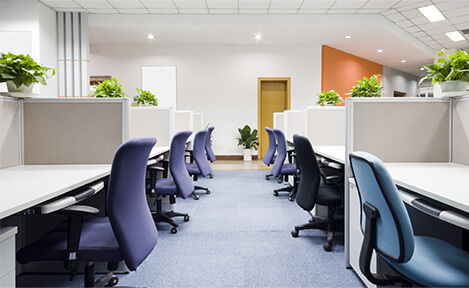 If you have a large office that needs a clean, we can provide a full office cleaning package to suit your requirements. Using steam extraction cleaners, our staff can restore your carpets to their former glory by removing any dirt and grime which has built up over time. Cleaning with not only improves the look of the carpets and of the room in question but will also improve the air quality making it a healthier place to spend time with your family. Our commitment to quality and high standards remains our priority at all times. 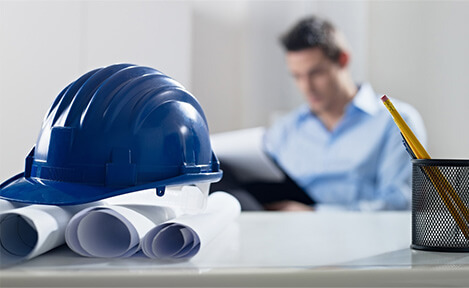 Our construction department has more than ten years experience in cleaning and maintaining building sites all across the country. Even before your site has broken ground, we will be on hand to take care of your welfare facilities. We can provide you with cleaners and labourers and many other trades. With all the traffic moving through your site offices, it can be a challenge to keep up to the standards you expect. Our welfare cleaners will maintain your site facilities to the highest level, so you can get on with the business of running your job. All of our commercial cleaners operatives carry CSCS cards, and our supervisors are all SSSTS trained, so your facilities will always be HSE compliant. All our expert and friendly cleaners are uniformed, and operate locally enabling you to receive a professional, reliable and effective regular commercial cleaning service. If your local authority require you to employ staff who live in the borough, there is a good chance we will have cleaners who live on your doorstep. We use the best known techniques and cleaning methods, and continually monitor the industry in order to stay informed of the latest developments. By doing this, our clients can rest assured that they are getting the best possible service available. At Benchmark, we pride ourselves on providing a bespoke service to each individual client. You will be sent the same cleaners each week, and we will provide a reliable replacement for you to cover for illness or holidays. We provide the latest cleaning products and equipment to all our staff, ensuring that you only receive the highest quality service at the most competitive rate.